Chris Kresser released an awesome article recently about how stress contributes to SIBO. 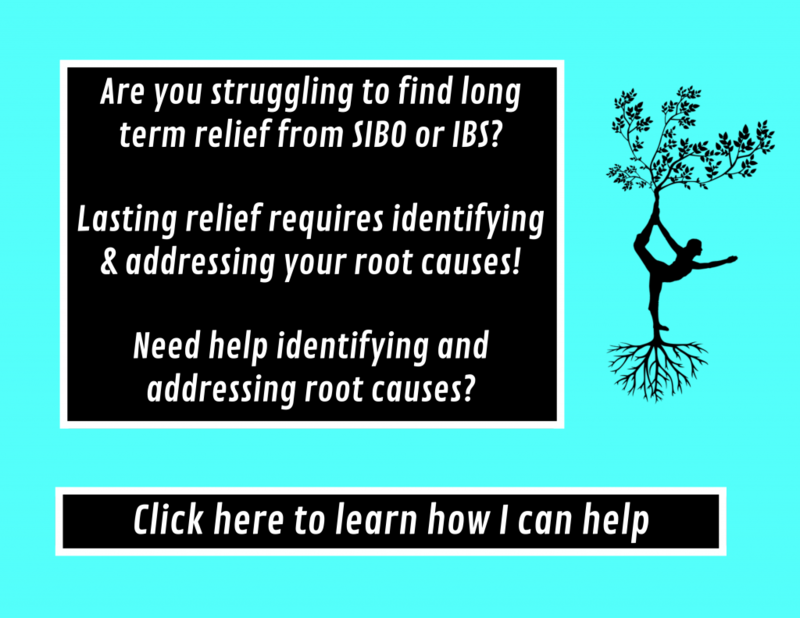 This has been a topic I have been meaning to cover for a long time and his article inspired me to write about my knowledge and experience with the SIBO-stress connection. I have touched on how stress wreaks havoc on the gut in the past, but I am excited to do a deeper dive into the topic and discuss how I personally manage my own stress. Those with IBS are often sick and tired of being told by their doctor that their gut symptoms are just a product of stress. I always felt like the doctor was totally dismissing me when he was telling me that all my bloating and GI pain was just a result of the stress of my new job. I hate to admit that my doctor wasn’t completely wrong. While this stress wasn’t the only driver of my GI issues, it was definitely a huge contributor. The most detrimental effect of stress for us SIBO sufferers is that it totally shuts down nonessential systems, which includes our digestive system. The body doesn’t want to use its limited energy and resources to digest that meal you just ate if you are being chased by a bear. This shut down is advantageous to us in response to acute stressors, but most of us suffer from chronic stress which can shut our digestion down indefinitely. We are maladapted to deal with the chronic stress that we face in the modern world. Physiological responses to stress specific to the digestive system can leave you susceptible to SIBO. In order to properly digest food, your sympathetic nervous system (fight or flight) needs to be shut down and your parasympathetic nervous system needs to be activated. The parasympathetic nervous system puts your body in a state to “rest and digest”. The parasympathetic system is activated by the vagus nerve. Those with SIBO often have weak vagus nerve function and therefore are more chronically stuck in a fight or flight state that hinders digestion and MMC activity. Therefore, getting your body out of a fight or flight and into its rest and digest state is needed to beat SIBO. Stress management is often overlooked in SIBO treatment. I failed to address stress in the initial phases of my SIBO treatment. There were two main reasons why I sucked at stress management back in my SIBO days. The first reason being that I was so overwhelmed with initiating diet changes that I failed to address the chronic stress in my life. When I started my SIBO journey, I was expending so much time and energy trying to achieve a perfect SIBO diet that I had nothing left to focus on anything else. To make matters worse, the pursuit of diet perfection skyrocketed my stress level. It felt like I was white knuckling through everyday to stay on the straight and narrow with my diet restrictions. The stress inducing effects of these restrictive diets are a huge reason why they are not effective. Stress is so counterproductive to healing a gut problem. Finding a diet that you can manage and maintain comfortably without dread or stress is key to treating your SIBO. The second reason I didn’t address my stress is that I felt like it was out of my control. Trying to tackle chronic stress in my life seemed more difficult than making diet changes or taking antimicrobials. As someone who tends to be an overachiever, I was very comfortable and almost thrived in stressful environments. I never learned how to manage stress. I was someone that just always got the job done no matter what it took (even if that meant long hours and all nighters). I also had this false idea that to manage stress I had to abandon anything that added extra stress in my life. Later, I learned there is a difference between a good stress and a bad stress. For instance, a bad stress would be working a 60 hours a week at a job you hate or staying in an abusive relationship. Good stress on the other hand can include getting married, having a baby or a promotion. An effective stress management strategy is one that reduces bad stress and makes you more resilient to good stress. The focus should be to become more tolerant to stress rather than eliminating it completely. I am still tweaking my stress management strategies and finding new ways to build my resilience to stress, but I have found some great strategies that help me manage stress. Here are the 10 stress management techniques that I have used to help me manage stress. I was a little skeptical that meditation would work for me. Mainly because I tend to be a bit hyper and felt that I wouldn’t be good at turning my brain off. But, holy cow you guys! Meditation has been huge in my ability to raise my stress tolerance. For me, the apps and the guided meditations didn’t work well for me. But, vedic style meditation really clicked with my and still helps me feel my best. This style involves sitting in a comfortable chair with your eyes closed and repeating a mantra in your head over and over again until you feel the mantra slipping away. I took an online course called ZIVA Mind to learn how to meditate and it was money well spent. I have more energy and my digestion is smooth when I do it regularly (at least once a day for 15 minutes). There were two really big misconceptions about meditation that I learned were false through my meditation training. First, I believed the point of mediation was to completely quiet the mind and push thoughts out. I learned that you can’t control your thoughts and you can still have a powerful mediation session if you have thoughts pop up. Second, I believed that meditation required some breath work and deep breathing, but it is actually the opposite. When you are in a deep meditative state, you will notice that your breathing is very shallow. It almost feels like you aren’t breathing. It is because your body is in a deep state of rest that doesn’t require much oxygen. Research shows that meditation causes positive changes in the brain. The amygdala, the worry wort and flight or fight center of the brain, shrinks when you practice mediation daily. This amygdala shrinkage results in lower stress levels. Meditators also have positive changes in areas of the brain that deal with executive functions, memory, cognition and empathy. Meditation is not for everyone, but I encourage everyone to give it a try and see if they like it! I know it can be hard to feel grateful when you feel so bad with GI issues, but it can help you stay positive and lower stress. I practice gratitude in a couple of different ways. First, I end my meditation sessions by thinking about everything I am grateful for. Whether it is being able to play with my little niece or a nice walk that I recently experienced, I always find at least 3 things I am grateful for. Second, I try to take 10-15 seconds before each meal to be thankful for the food that is on my plate. I find that this helps my body relax and prepare for my meal. Another way you could incorporate gratitude into your daily routine is by using a gratitude journal. Write down three things that they are grateful for each day. I want to disclaimer this post by saying that I am not always positive and sometimes it is ok to have a down in the dumps day. Sometimes you may need to throw yourself a pity party. It may take moving through those sad and frustrating emotions to reduce stress and move forward. Human connection is so important to healing. It can be easy to become so consumed by diet changes and SIBO treatments that you unintentionally crowd out your social life. I know that this happened with me. Feeling disconnected from your tribe is enough to activate your stress response. Try to make sure that you are meeting up with your friends at least once a week. Laughter has been shown to lower stress hormones like cortisol. You don’t even have to go to a comedy show. Research shows that watching a funny TV show lowers cortisol by around 70%. I love hanging around people that make me laugh too. Even playing a silly game like charades can help us be silly and relax. Switch of the stress inducing news and turn on some Office re-runs. Your relaxed mind will thank you. It is time for you to get your cuddle on! Give some one you love a squeeze. Physical affection lowers cortisol and sends us straight back into rest and digest mode. Both undereating calories and/or carbohydrates can cause an increase in stress and cortisol levels. It is easy to under eat both carbs and calories if you are on a restrictive SIBO diet. I made both of these mistakes during my SIBO journey. I was eating low carb and unintentionally undereating, because I wasn’t adding enough fat to my meals to replace the carbs I was omitting. This calories deficit caused my cortisol levels to rise. Here is a great article that can help you determine if you are undereating. Low carb diets also raise cortisol levels. When our blood glucose level drops too low, cortisol is released, which stimulates the process of gluconeogenesis. This process breaks down amino acids from protein into glucose to fuel our brain and red blood cells, which require glucose. For awhile I was eating probably like 75 grams of carbs a day, which was not enough carbs for my brain and red blood cells. Therefore, my body raised cortisol levels to signal to my cells to perform gluconeogenesis to make the glucose that is required for my brain. My digestion, sleep, energy and mood all improved when I added more carbs (at least 150 grams a day) into my diet. Slowly upping carbs may be necessary to lower cortisol levels. Taking some time to hike or camp in the great outdoors is key to managing my own stress levels. I try to go outside as much as possible. I love hiking and trail running. Research has shown that being in the woods lowers cortisol and reduces the fight or flight response. Trees are powerful healers! I am a huge music lover. I always work better and feel better when I listen to calm soothing music. Here is a list of songs that have been proven to lower stress and anxiety. I have also been known to bust moves whenever possible. Humans since the beginning of time have used dance to escape stress. I will literally find any excuse to dance. I often get some strange looks when I put my head phones on while I shop for groceries, which inevitably leads to a full on boogie session while I am perusing for produce. Dance can also provide a way to move through negative emotions and stress. If you are sad, listen to a song that brings tears to your eyes and if you are angry find a jam that you can bang your head to. I love going on long walks, especially when I can break up my work day with a walk. I am a big fan of an evening stroll especially if I am joined by friends or family. Walking is one of the easiest and cheapest ways that you can relieve stress. All you have to do is grab some sneakers and go. These help you activate your parasympathetic nervous system to reduce stress and improve digestion. They can also easily be incorporated into your day and have a huge impact on your health. Personally, I noticed a huge difference in my motility and digestion when I would gargle multiple times a day. To learn more about the brain-gut axis check out this past blog post. Stress management should always be incorporated into your SIBO treatment plan. Also a quick update! I have launched my consulting services! If you are interested in learning more about my services, please click here. Also, please like us on Facebook if you haven’t already! I love interacting with all my SIBO pals on Facebook. Next Next post: Will I always have SIBO? I totally agree about stress management. If we did not have some emotional issues about stress we certainly have after dealing with SIBO anda IBS for many years. Last year I had an FMT in Sydney with Professor Borody unfortunately not successful. I had now more gut problems after FMT. However never give up hope I have started with a Naturapath and after a full gut biome it now appears I have SIBO and my Pancreas has also shut down this has contributed to my weight loss. The good news is after all using all relevant supplements I am now feeling better and my gut is slowly improving. Her feelings were that my inability to handle stress was contributing to many of my gut issues. Her recommendation were go to a Hypnotherapist to find learn how to relax. The best money I have ever spent on my health. I am now on my third session and I have never felt so in control of my life. Holy Cow Linda!! That is awesome! I am happy that you were able to get to the root of your gut issues. I think stress is often missed! Hypnotherapy has always been an interesting practice to me ever since I read Biology of Belief by Bruce Lipton. I will have to look into hypnotherapy a little more. I actually met and clicked with one probably 2 years ago, but it was at a networking event. Very cool to learn that it can be so effective at helping you with your stress!